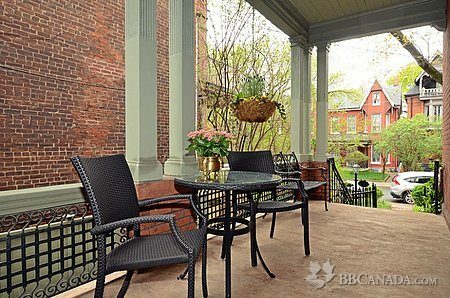 Beautifully renovated and restored historic home; close to U of T.
Pricing per night from C$150 to C$300 plus 13% HST. Additional person $30. Add $20 for 1-night stay if available. 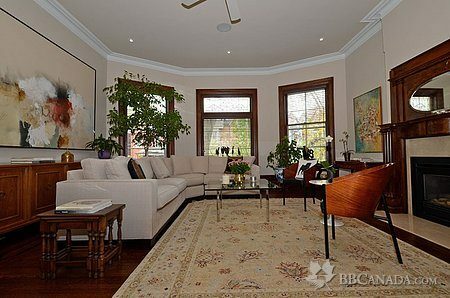 Beautifully renovated and restored historic home in Toronto's south Annex / Little Italy area in the west part of downtown, steps from public transit, close to the University of Toronto, museums, galleries, bookstores, restaurants and shopping. Full breakfasts are served in the main floor dining room, with a hot entree, fresh fruit, juice, cereal, artisan breads and cheeses, Italian coffee (cappuccino, espresso, latte or Americano) and a selection of fine black, green and herbal teas. Historic ambience with stained and leaded glass windows, wood panelling, four fireplaces and other original features, with a beautiful garden and large verandah. Extensive soundproofing, in-floor heating, air conditioning and a fresh air system. B&B rooms with king or queen bed or long twin beds, or a one bedroom suite with private kitchen and dining area. All have private 4-piece bathrooms with soaker tubs and heated towel racks, phone, flat-screen TV, robes, hair drier, iron and cotton linens. Free onsite parking, high-speed internet, printer and laundry facilities are available, as are bottled water, Perrier and tourist information. Includes use of home gym with treadmill, lifecycle, elliptical, mats, exercise balls and free weights. Children are welcome. Portacrib and high chair are available. Discounted rates for long-term stays. Two small dogs in residence. No smoking ANYWHERE on property. Check In/Check Out : Check in flexible; check out 11 a.m.